One of the most universal plights of the average homeschooled highschooler is the matter of learning a language, as four years of language studies are required for entrance into most colleges. Since homeschoolers are both blessed and burdened, depending on the situation, with the removal of the guidelines and restrictions that bind your ordinary public high school student, many homeschooled teens and parents of homeschooled teens turn to groups, forums, and other networks of exchange in search of the most effective means of studying a language at a mature college preparatory level. This is by no means a pointless endeavor, as it can be assured that most public high schools, at least in the United States, are not giving their students the most enriching and comprehensive education in languages. Although the internet has for a long time been utilized as a language-learning resource for homeschoolers, the rapidly accelerating developments taking place within the realm of online learning have the potential to further enrich and diversify the process. Before arriving at the prospects for homeschoolers in this new reality centered on online learning, a few words about what the language-learning process looks like for your average public high school student. First, it must be established that the vast majority of public high schools in the United States teach Spanish and French (1, the ACTFL, 2011). An overwhelming amount of US public high school students, almost 70% as of 2014 (2, the AATSP, 2014), choose to study Spanish, probably because they assume it will be the most immediately useful language for them given the United States’ border with Mexico. Second, it should be noted that the process of updating curriculum in any state controlled public high school in the United States, for languages as well as for any other subject, is an incredibly difficult process. For a public high school to adopt a new extracurricular activity or textbook, for example, can take over five years for a request to be approved. What can be drawn from these two observations?The lack of diversity in languages taught in US public high schools reflects a general lack of diversity and adaptability in the public high school curriculum. Although Spanish is a perfectly worthwhile language to learn, jobs for Spanish-speakers are naturally subject to more competition because of the surplus of Spanish speakers jockeying for them. A great deal of opportunities abound for United States citizens who speak other languages, for example in French-Speaking African countries, the center of a great deal of economic and political development today, in Eastern Europe, where United States ambassadors are predicted to soon be in short supply, and in Asia, which is an indispensable economic agent in today’s web of international relations. The amount of time it takes to update a state-run public high school’s curriculum suggests that public high school students in the United States are receiving an outdated learning experience. This is indeed the case, as is demonstrated by the fact that most of the textbooks read by today’s high school classes are left over from the 1990s. The grim situation facing most United States public high school students has been elaborated on to such a degree to highlight the unique and valuable opportunities homeschooled students and other students not studying under educational institutions not affiliated with the state have at their disposal, as they are not constricted by the same regulations. That being said, too many homeschoolers are not taking advantage of these opportunities, preferring to resort to the better established but not necessarily more intuitive methods of learning a language outside of a classroom, such as Rosetta Stone, or to turn to supplementary websites as a primary resource for pursuing fluency in a language. Using the former and the latter in isolation is not likely to yield amazing results among students. However, incorporating simple programs and online resources into a modern, eclectic approach to languages seems a very likely candidate for the solution to revitalizing and diversifying the language-learning experience in the homeschool community. I will present my own personal experience with learning languages as an independent online student, simply as an example of how utilizing a variety of online sources can allow a student to successfully immerse him or herself in any given language. In my first year of high school, I went with the current and began learning French through more conventional options available to homeschoolers such as Rosetta Stone. I chose French not because I had a deep passion or curiosity for the language but because it had been one of the two languages available to me at the school I attended as a junior high school student, the other being Spanish, and I figured it would be easier to continue with that language at home rather than pursuing a different one. After a year, I found that I hadn’t made very significant progress, having not even mastered all present-tense conjugations and having not built up my vocabulary to anything conversational. I also found that I wasn’t enjoying the language-learning process as I felt that I should. In the face of what I, having a reputation for being hard on myself, considered something of a language-learning failure, I decided to make a bold move and take a more unconventional path. First, I decided to switch languages. The Italian language had always fascinated me, as I had studied classical voice for some time and was enamored with opera, an Italian innovation. I longed to be able to listen to an opera and understand it without having to pull up an English translation of the libretto. All of this aside, I loved the way the Italian language sounded, like music to my ears. Instead of ordering a run-of-the-mill textbook or purchasing Rosetta Stone’s Italian course, I went looking for private Italian tutors online. Over Skype, I found and contacted a highly intelligent and capable teacher from Italy fluent in Italian and English, among other languages, who agreed to teach me. We began meeting weekly and working towards mastery in the Italian language from the most fundamental level. With her guidance, I tackled the basics of Italian through talking with her, reading texts that she would send me, and searching for online resources in my own time. I reached a major milestone when I was able to converse with her completely in Italian, imperfect Italian though it was and still is. 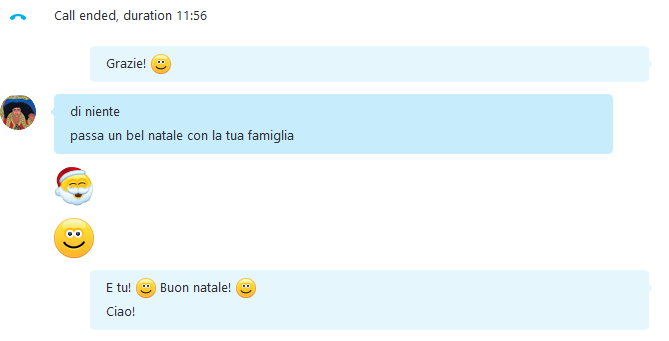 Finally, I searched for and found an Italian pen pal whom I write in Italian and who, in turn, writes me in English. A few lines that my Italian teacher and I wrote to each other after a lesson. 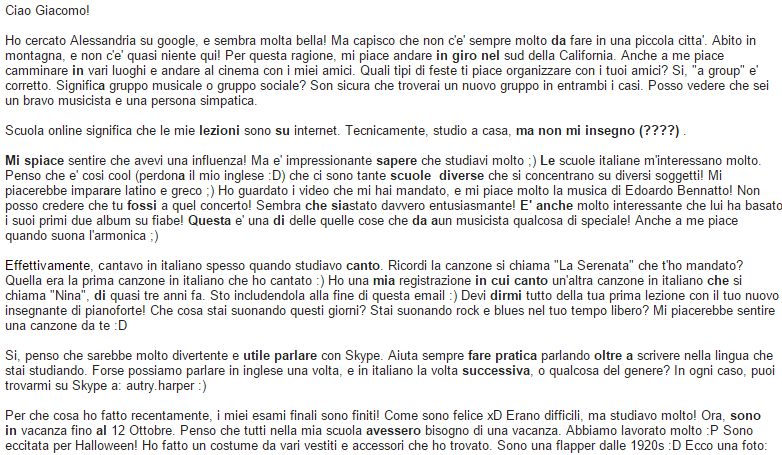 My Italian pen pal Giacomo’s corrections of an email I sent him. I very intentionally built my own language-learning agenda, choosing a language because I was passionate about it rather than because it was a popular language to learn. I utilized the best elements from a variety of resource types. For example, over the internet I looked into a wide variety of language learning tools, podcasts, and websites and pulled into my repertoire the ones that I felt most successfully immersed me in the language. I found a hidden gem in Cher Hale’s The Iceberg Project, a blog and podcast series founded by an Italian speaker who understands the difficulties that many people have with getting the hang of a foreign language who very successfully utilizes the unique educational opportunities that the Internet has to offer. Two extremely beneficial processes I threw myself into were the process of reading, speaking, and writing completely in Italian and the process of communicating with other language learners and teachers both in person and online. Immersing oneself completely in a language is essential, as it teaches one to be resilient and resourceful in picking key words out of a conversation in order to follow along. Communicating with others in the language that you are learning forces you to push yourself to be able to express yourself to a fellow human being concisely and correctly. I have had two Italian pen pals so far, and in both instances we enjoyed writing each other so much that our emails of several lines quickly developed into emails of several paragraphs. In giving each other feedback, we have provided each other with concrete examples of how the respective languages that we are learning are used in everyday conversation. For several months, I attended an Italian after school program that was comprised largely of Italian families, all of whom I loved to converse with in their native tongue. This was by far my favorite experience with Italian, as nothing compares to face-to-face communication in la bella lingua. The point that I am at today with Italian took me a while to arrive at, and the resources I used along the way are by no means what everyone will use or even find helpful, but an important lesson for homeschoolers about learning a language can be extracted from my own findings. Firstly, the fact that a particular learning resource is widely used by no means implies that it is fundamentally better than any other learning resource. It very well could be, but often alternative resources that would be a better fit for other students simply have not been discovered yet. Secondly, the internet is revolutionizing the nature of learning outside of the classroom and, if utilized correctly, has the potential to be an indispensable resource for learning languages or anything else. Thirdly, the fact that the Internet has connected the world is vital for any language students to realize. It would be a shame not to take advantage of the many connections students have today by interacting with real people who speak the language they are studying, as it contributes immensely to the process.By keeping these points in mind, one can go to unimaginable heights with a language in a truly eclectic and academic way. If your child would like to be considered for publication, please send his or her submission to SEA Homeschoolers. You can read more about this new section here here. Autry Harper is currently in her junior year of high school and attends an online tuition-free school called Harari College Worldwide. She is currently in the midst of the college application process. Her interests lie in the humanities, particularly foreign languages, the arts, and global affairs. I loved reading about your journey! Great article! I would love to know how you went about finding your resources, such as the online tutor. Was it a google search for specific parameters? How did you vet her? Same with the pen pals; was there a resource you were able to use to get matched? The after school program sounds amazing as well. Was this through your local school district or did you do an online local search for “Italian after school programs”. Your resources sound incredible and I love how you surrounded yourself with the language. I am sure you gleaned an abundance of culture from your experiences. well written and insightful. Thank you for your interest. I’ll be glad to answer your questions! I found my online tutor through my school, as it’s an international online school and has connections with several language tutors who utilize Skype. However, I can recommend a great site called italki (www.italki.com) that connects language learners with native speakers and teachers! As for vetting her, we decided to call each other on the first day, as hearing a language teacher talk is a pretty good indicator of how competent they are. There are several free sites that can connect language learners looking for a penpal. I recommend Students of the World (www.studentsoftheworld.info) and My Language Exchange (mylanguageexchange.com/penpals.asp). Of course, if you’re looking for a pen pal online, you’re going to come across the occasional poser and weirdo, so you have to be smart and sort them out. It’s actually fairly easy to tell whether a language-exchange pen pal is genuine, because if they can’t speak the language they’re supposed to be fluent in they’re obviously not who they say they are. I would ask them to write you first in their native language and then to correct something you’ve written in that language to see if they have a mastery of it. Of course, you should do the same for them. To tell you the truth, I simply found that Italian after school program by doing an Internet search for Italian classes in my area. You’d be surprised what you can find if you keep looking! This is great information! We just launched a new website where people can have 1-on-1 classes with excellent instructors all over the world!